I Sing The Blues Eclectic first saw the light of day in 2011 but is once more now available this year. Farrell is a US expat now resident in southern Spain where he gigs at clubs and festivals with a fine following and well deserved growing reputation. This twelve-track release is little short of a showcase of his talents as both a picker and a singer/songwriter. 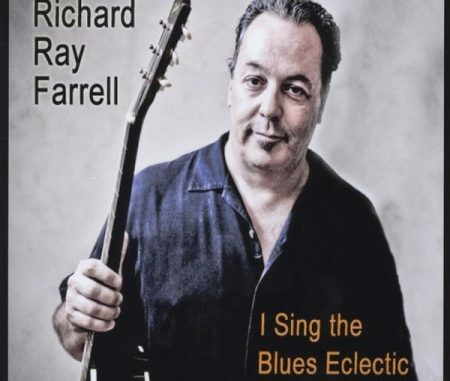 Farrell slides effortlessly from style to style, acoustic-biased with some excellent harp-work and growling vocals that absolutely hit the blues-spot every time. He switches from resonator to straight acoustic picking and in reality there’s not a scrap of dead-wood in the mix, a genuine tribute to his writing and playing abilities. He has clearly mastered the art of Piedmont picking, Texas shuffle and boogie woogie and has the confidence to incorporate all styles in the album. The closer is a near-gospel/spiritual number that echoes the Staples, the Revelators and Blind Boys at times while “Listenin’ To The Falling Rain” is one of those songs that immediately registers, beds itself and is a number many will recognise without ever having realised who was the driving force behind it. Overall, this is one of those all too rare things – an album of true beauty, masterful, soulful and succulently blues-inspired.